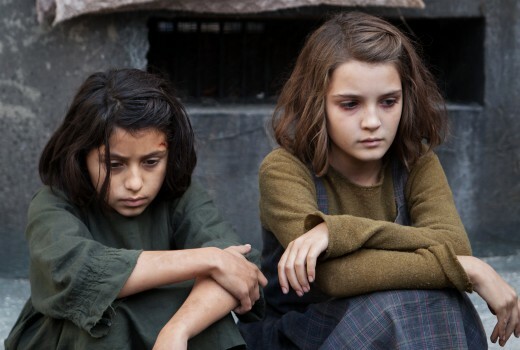 Just when you thought the TV year was nearly done and dusted, along comes HBO’s My Brilliant Friend. And it seems the best has been left until last. You know you are watching something special with this 8 part series, based on the novel of the same name by Elena Ferrante. Director and co-writer Saverio Costanzo brings a masterful and delicate hand to this exquisite, sometimes brutal, tale of two young girls living in an impoverished community of post War Naples (yes it is all subtitled). Their world extends from the local school to their apartments with a town piazza in the middle. It’s the kind of place where subsisting from one day to the next does not come without toil, where women’s chores are all domestic and the men fix shoes and sell fruit on the street. Under laundry flapping from balconies, townsfolk gather to gossip and children play. The series actually opens in the present with an elderly Elena Greco reflecting on her friend Raffaella ‘Lila’ Cerullo and the lifelong bond the two forged in those harshest of days…..
Elena (Elisa Del Genio) first noticed Lila (Ludovica Nasti) as a spirited but intelligent classmate, surprising their teacher with a self-taught ability to read and write. But Lila is also an outcast, prompting a rival boys’ class to punish her for humiliating them. Yet Elena is drawn to the girl, partly through being intimidated by her, but also being drawn to her fearless nature. “I felt confusedly attracted to this bad girl,” Elena recalls. In this tiny world problems are magnified, often as public consumption: a husband leaves his wife, men fight openly on the street and women on the stairs, children throw rocks at one another, toys go missing, and businesses are subjected to standover tactics by local thugs. High drama ricochets within a small community. But out of the dirt there are green offshoots in the form of two bright girls with an insatiable desire to learn and to improve on their lot. Elena follows Lila’s lead to test for middle school, something that is frowned upon by her own mother, begrudging of opportunities she never had. Even when the girls are subjected to beatings from parents, they find solace and strength in one another. The casting of this HBO / RAI production is sensational. Unknowns Elisa Del Genio & Ludovica Nasti deliver profoundly beautiful performances, restrained but authentic, old souls in young faces, rich in expression and subtlety. Mark them down for Emmy contention now. Across the 8 episodes they will grow into teenagers portrayed by Margherita Mazzucco and Gaia Girace. Director Saverio Costanzo magically recreates this provincial community with the help of production designer Giancarlo Basili. The tale of female empowerment, woven into a coming of age story, is captivatingly realised, making this perfect 2018 fare. My Brilliant Friend is the first of 4 novels that Elena Ferrante considers a larger work and we can only hope HBO / RAI bring them all to the small screen. Life can be beautiful and cruel all at the same time, but the human condition prevails where there is hope, and a hand to hold along the way. My Brilliant Friend airs 8:30pm Tuesdays on FOX Showcase. Much of post WW2 Italian classic cinema focusses on the poor and marginalised-‘Bicycle Thieves’. ‘The Road’, ‘2 Women’ ,’Umberto D’ etc etc-this tended to change by the 1960s as Italy recovered but it’s always been there.